The 2nd Stocktaking Conference of The Global Tiger Recovery Program (GTRP) closed today with tiger range governments agreeing that while progress had been made, critical areas of concern remained. September 16th, Kuala Lumpur: The 2nd Stocktaking Conference of The Global Tiger Recovery Program (GTRP) closed today with tiger range governments agreeing that while progress had been made, critical areas of concern remained. The Dhaka Conference brought together 140 tiger experts from over 20 countries and is the latest step in the process which began in 2010 at the “Tiger Summit” in St Petersburg, Russia. There tiger governments agreed to double wild tiger numbers by 2022, a goal known as Tx2. The conference was attended by the Honourable Prime Minister Sheikh Hasina and was hosted by the Government of Bangladesh, the Global Tiger Initiative and the Global Tiger Forum. During an adjacent meeting of the Global Tiger Forum, the governments of Nepal and India together with WWF India and WWF Nepal released the results of the world’s first ever trans-boundary tiger survey. The report entitled “Tigers of the Trans-boundary Terai Arc Landscape” was carried out between November 2012 and June 2013, covers an area of around 5300 km2 and documents the movement of tigers between forests in India and Nepal based on camera trap data. A total of 239 individual adult tigers were identiﬁed from camera trap photos, of which 89 were adult males and 145 were adult females. The gender of five of the tigers could not be determined. Tiger are endangered. The current wild tiger population estimate - as few as 3200 - was agreed in 2010. Since then poaching has reached critical levels and is the greatest threat to wild tigers today. Statistics from TRAFFIC, the wildlife trade monitoring network, show that a minimum of 1590 tigers were seized between January 2000 and April 2014. That represents an average of two per week. 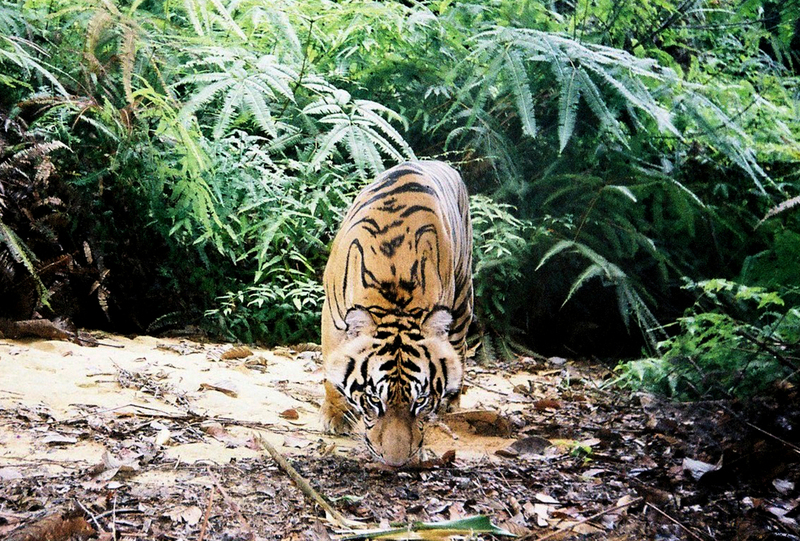 A young tiger captured by camera trap in Bukit Betabuh Protection Forest.